Senior net-minder Michael Lackey posted another wall-like performance on Tuesday, rejecting all but one of the 25 shots he faced in a winning effort. WALTHAM, Mass. 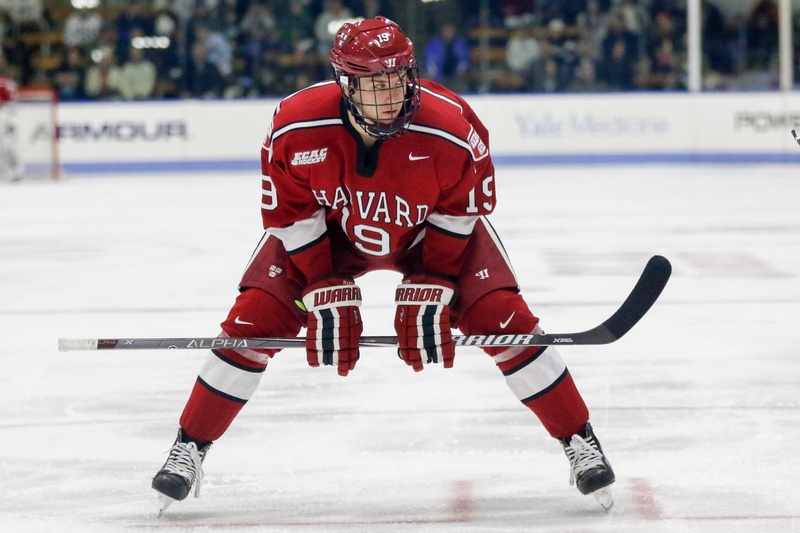 — The Harvard men’s hockey team can feel a little bit cheerier this holiday season after pocketing a win on Tuesday night against nearby foe Bentley. The Crimson (5-4-2, 2-3-2 ECAC) outlasted the Falcons (5-10-1, 4-7-1 Atlantic Hockey) in a physical tilt that marked the last of both teams’ pre-winter break schedules. Six minutes into the third period, forward Jack Donato skated down the right side of the ice and into the offensive zone. With linemate Frédéric Grégoire driving the back post, the sophomore called his own number and ripped a shot over the glove of Bentley goaltender Aidan Pelino. 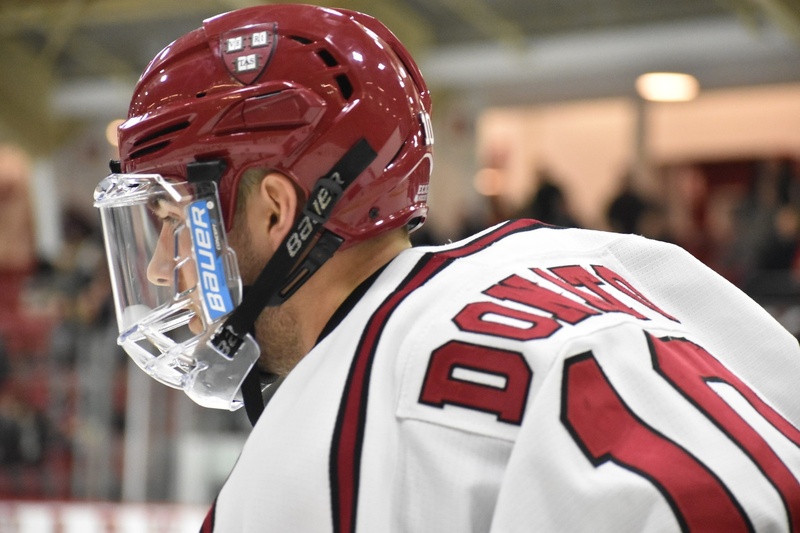 Donato’s snipe survived to be the game-winner, as Harvard skated to a 2-1 victory over the Falcons in its first-ever clash at Bentley Arena. The Crimson enters the four-week holiday break one game above .500 and feeling slightly better than it did after Saturday’s frustrating loss to then-No. 16 Cornell. Crimson net-minder Michael Lackey posted another strong outing on Tuesday (1 GA, .960 SV%), building on several sturdy performances against Colgate and Cornell (twice). The senior has seen the puck effectively and exuded confidence between the pipes, and his numbers show it. Since Thanksgiving, Lackey is 3-1-0 on a 1.26 goals against average and a .955 save percentage. Sophomore forward Jack Donato potted his second goal of the season off a well-executed rush play with his new linemates. On Tuesday night, Lackey was able to limit Bentley to one goal, despite the home squad entering the matchup in the top half of Division I in goals per game (2.93) and in the top 20 nationally in powerplay percentage (20.8%). The one score he did allow came courtesy of Falcons sophomore forward Brendan Hamblet, who put home an initial wrap-around feed from linemate Jonathan Desbiens. The 13:06 goal trimmed the Crimson lead to just one puck, making the remaining seven minutes interesting as Bentley tried to even the ledger. Lackey held his post, however, and sealed the victory. For the sixth time this season, Harvard opened the scoring. Early in the second frame, freshman forward Jack Drury punched a one-timer through the pads of Pelino for his fourth strike of the year. Fellow rookie Casey Dornbach nabbed the assist on the goal, good for his 14th apple of the season. Dornbach (2–14—16) is tied for first in outright points among NCAA freshmen and paces his fellow first-years in assists, as well as per-game averages in both points and assists. The winger’s hot start to the season earned him ECAC Rookie of the Month honors for November, and after his helper on Tuesday, he sits just a spot behind teammate Adam Fox for the highest assists-per-game average in college hockey (1.27). Freshman forward Jack Drury continued his productive year (4–8—12), burying a feed from his right wing, fellow rookie Casey Dornbach, early in the second period. After Tuesday’s tilt, first-years account for 37 percent of the Crimson’s total point production through 11 games, compared to just 24 percent through as many contests last season. Despite a relatively minor history between Harvard and Bentley — the teams have squared off just five times, with the Crimson having won each matchup — Tuesday’s contest took on a physical tone. Even prior to the first intermission, post-whistle exchanges were heated and chippy collisions were frequent. Both teams were skating in their third bout in five nights, so the physicality took its toll. Also noteworthy in the mid-week showdown, Fox failed to register a point for just the second time this season, with the first occasion being this past Saturday. The junior (5–15—20) still ranks first among defensemen in points and tops college hockey in points per game (1.82) and assists per game (1.36). 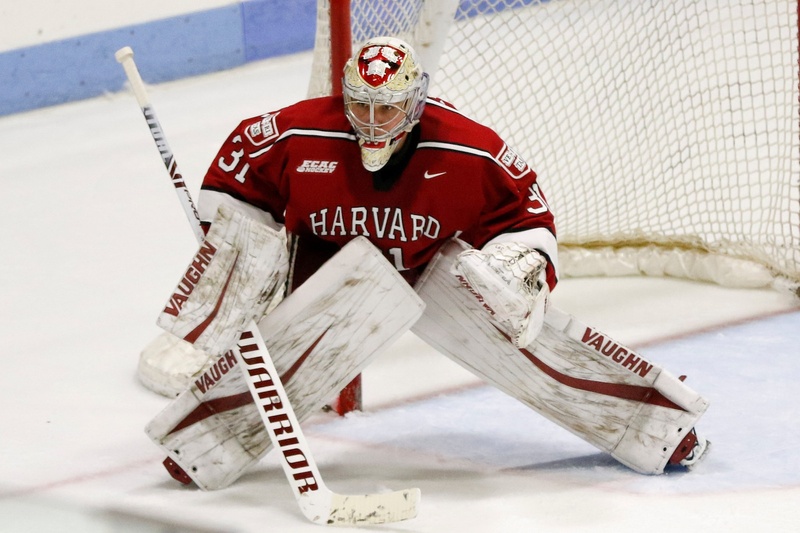 Harvard returns to regular-season action in early January with a home tilt against RPI.